This is the second part of implementing inorder traversal of a binary tree in Java, in the first part, I have shown you how to solve this problem using recursion and in this part, we'll implement inorder traversal algorithm without recursion. Now, some of you might argue, why use iteration if the recursive solution is so easy to implement? Well, that's true, but the iterative solution is often regarded better as they are not prone to StackOverFlowError. Another reason why we are discussing iterative solution here is because of technical interviews. If you to go to a programmer job interview, you will find that Interviewer will often ask you to solve the same problem using iteration and recursion e.g. Fibonacci series or String reversal algorithm. It's also good for your learning and developing algorithm skill, which is very important for becoming a better programmer. The in order algorithm is very similar to the preorder traversal algorithm we have seen earlier, as both are the depth-first algorithm. 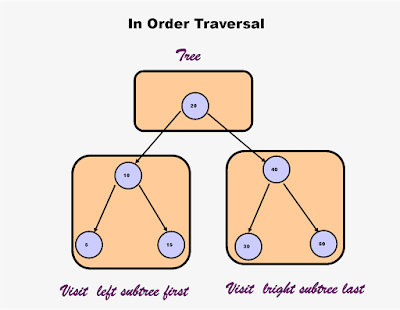 The only difference between inorder and preorder traversal is the order on which they visit left subtree, root, and right subtree. The inorder traversal first explores left subtree until it reaches a leaf node, from their it print value of the node and starts exploring right subtree of the node. The process continues until all nodes are visited. One of the worth knowing thing about inorder traversal is that it prints all nodes of the tree in sorted order if given binary tree is binary search tree. A useful detail to solve many tree based problems. Though these are not the only way to traverse the tree, you can also use breadth-first traversal algorithm e.g. level order traversal (see Introduction to Algorithms), which traverses all nodes of a level before moving on to new level. If you are preparing for Google or Amazon developer interviews, knowing as many algorithms as possible will improve your chances. You can see that the logic is very much similar to an iterative pre-order algorithm with the only thing we are continuing with left subtree first. This algorithm is slightly tougher than recursive one, which is extremely easy. If you find coding this algorithm difficult by yourself, maybe it's time to refresh your knowledge with a good data structure and algorithm book like Algorithm Design manual. Here is our complete Java program to implement iterative inorder traversal in Java. Similar to the iterative PreOrder algorithm we have used Stack to convert recursive algorithm to an iterative one. We have used same classes BinaryTree and TreeNode, which is used in earlier exercises. The code for inorder traversal is encapsulated in the inOrderWithoutRecursion() method. That's all about how to traverse a binary tree using in-order traversal algorithm in Java. One of the common use of in-order traversal is to evaluate infix expressions and print nodes in sorted order of binary search tree. If you come across any other good use of in-order algorithm then please let us know. Good catch @Anonymous, Thanks, I'll update it.